Book News this week: The guys talk a little more about an article that goes deeper into the numbers from the AAP report on ebooks outselling paperbacks, and elaborate a little more on the challenges of auditing ebook sales. Mike Stackpole has a series of articles on digital publishing and self-publishing over on his website. 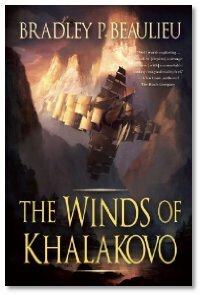 Interview: This week, Mike and Mike chat with Brad Beaulieu about his new novel, The Winds of Khalakovo, an epic fantasy series from Night Shade Books in the same vein as George R. R. Martin's "A Song of Ice and Fire". Brad talks about the Russian and Persian influences on the story and how those informed the development of character and cultural traits of the story as he was writing it, and about the writing symposiums he'd taken at GenCon and other conventions with various genre authors, and how those classes helped his writing craft. Keep an eye out for the sequel, The Straits of Galahesh, in April 2012. While listening to another book podcast (Books on the Nightstand) -sorry guys. They mentioned the ABA The Indie Sci-Fi & Fantasy Bestseller List http://news.bookweb.org/news/indie-sci-fi-fantasy-bestseller-list-6 what's interesting about this list is the number of older classics that appear on the list. I'd be interested in what others think of the list. Most of three weeks now without an episode; what's up? The RL issues that M.M. often mentions? Or did New Mexico finally get so hot that the Farpoint Studio's shields failed and it instantly vaporized? Is the DragonPage ending? I heard from SliceofSciFi that it was going on hiatus, but it did say for how long or why. Please let interested listeners know the duration of this hiatus.